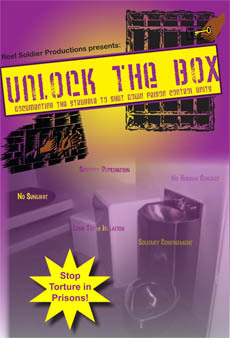 We are in receipt of a Censorship Notice (notice) for the above referenced issue of Under Lock & Key (ULK). The notice states that the publication was rejected because of alleged content in violation of DO 914.07. However, there are no references to page numbers of the alleged objectionable content or the specific content which is objectionable. It is unclear what content is alleged to be objectionable. We object to such failure to clearly state with specificity the location and content of the alleged objectionable material. Further, the notice without page references does not meet the scrutiny required by the Constitution and a more definite statement of the objectionable content is required. It is apparent from the face of recent censorship notices, the language used to justify the censorship is boilerplate. As such, the provides direct evidence of a blanket ban of all ULK publications in direct violation of our Constitutional rights and contrary to well-established federal case law. We require the decision to censor the issue referenced above be vacated and delivered to the prisoners to which it was addressed. 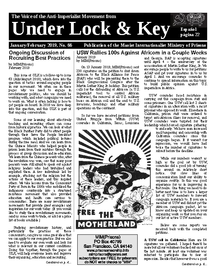 We have been advised that the two issues of Under Lock & Key, referenced above, have been censored by your facility. You have failed to provide notice to us as the sender/publisher. Further, the notice you have provided to Mr. XXXXXX is inadequate as a matter of law. Your facility is neither a state correctional facility nor an institution governed by the rules and regulations of the Virginia Department of Corrections, therefore you must make an individualized determination as to each publication based on your policies, pursuant to a clear and convincing standard, as required by the Virginia Administrative Code (the “Code”). As such, we object to your failure to provide notice to us, the sender/publisher, of the censorship and opportunity to appeal as required by law. Please provide a notice of censorship which clearly states the objectionable material and reason for censorship within fifteen (15) days of receipt of this letter. We direct your attention to § 630 of the Code. 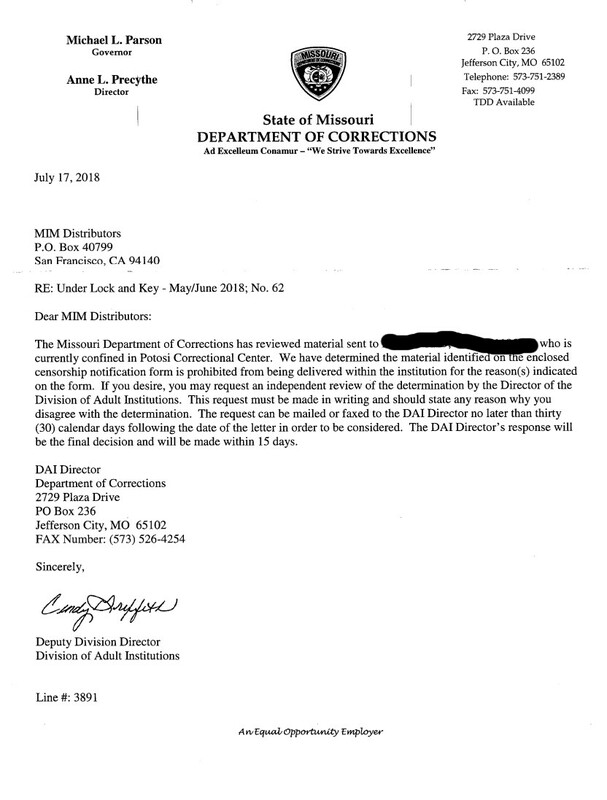 We further note that the standard you cite, 6VAC15-4D-650, provides the sender “shall be allowed the opportunity to appeal the seizure to the facility administrator or a designee empowered to reverse seizure.” Courts in the United States have long held a First Amendment right exists to protect the right of correspondence with prisoners. As previously noted a publisher or distributor must be given a meaningful opportunity to challenge any censorship. The law is clear, you are required to notify the sender/publisher of any censorship, so they may have the opportunity to appeal such censorship. Any failure to act within fifteen (15) days of the receipt of this letter may result in appropriate legal action being taken against the Middle River Regional Jail. We are in receipt of a Censorship Notice (notice) for the [email protected] Power and Struggle for Aztlan. The notice states that the publication was rejected because “talks about the rise and struggles for power of the [email protected] Nation within the prison system.” However, there are no references to page numbers of the alleged objectionable content or the specific content which is objectionable. The notice merely states that “5+” pages are objectionable. It is unclear what specific content is alleged to be objectionable. The notice without page references does not meet the scrutiny required by the Constitution and a more definite statement of the objectionable content is required. The Notice to Publisher is clear that the censoring official must “identify the page number(s).” You must provide the information which is objectionable with specific references to page numbers within fifteen (15) days. 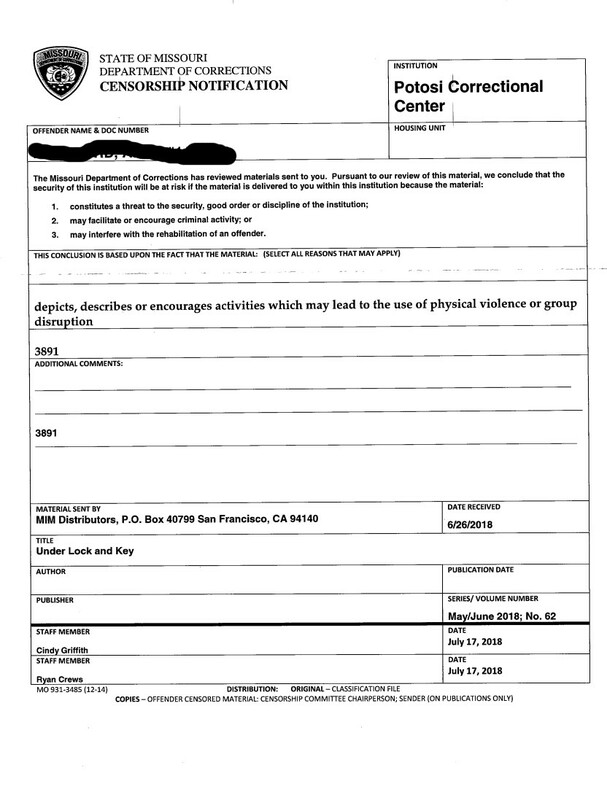 The Notice to Publisher was dated May 8, 2018. A review of our records show that we sent only one copy of the book to a prisoner in the Colorado Department of Corrections on August 14, 2017. We ask that you investigate the delay in providing notice of censorship. 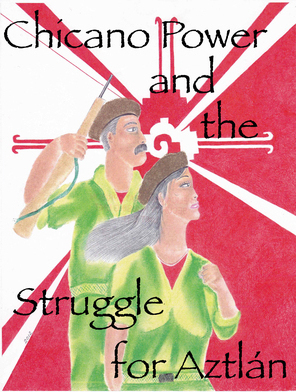 Further, we do not believe any material in the book is objectionable based on Colorado Department of Corrections policies or regulations. Therefore, we require the decision to censor the issue referenced above be vacated and delivered to the prisoners to which it was addressed.